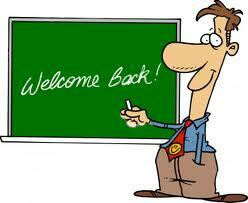 Los Boscos English Corner: Welcome back!! A new academic year full of surprises and new discoveries is waiting for us. Teachers begin the new year hopeful and full of energy. We cannot wait to see you again. Further, we want to show you the new projects and activities that we are going to be doing with all of you. We are going to continue working hard to incorporate the English language into our activities. To encompass different aspects of our curriculum as reflected in our school project. We have already started getting things ready. As ever, our blog is available and we encourage you to visit us regularly. Desde el departamento de inglés, nos gustaría que nos hicierais llegar todo tipo de sugerencias para los blogs de inglés. Con la ayuda de todos, podremos aprender más y hacerlos más nuestros, es decir, conseguir que se adapten más a nuestras necesidades y gustos personalizados. Welcome to the new academic year. We are waiting to see your new proposals for this course.